Are you not sure what to do this weekend? Are you thinking about making some popcorn and renting a movie? If you’re an animal lover like me you might be interested in renting Shelter Me from Redbox, a documentary about shelter dogs and their new homes. While browsing through our Facebook news feed and RSS feed the past couple days we saw DogTipper and Keep The Tail Wagging talking about the new Redbox Docmentary: Shelter Me. We were very excited to hear that RedBox would be donating the proceeds from the Shelter Me DVD rentals (through April 29th, 2013) to the Halo Pet Foundation. I was very excited to see that not only was this a documentary about shelter dogs, but also a story about how shelter dogs were helping people with disabilities. What was even more exciting was I caught a glimpse of one of the service dog jackets during the video and it looked a little bit like this one…I mean a lot…well I mean exactly like this one! In case you don’t recognize him that’s Apache proudly wearing his Canine Support Teams (CST) Puppy In Training jacket. The very same jacket I saw in the Shelter Me trailer! Apache was my 4th Guide Dog puppy in training and after getting dropped from the guide dog program moved on to CST and is now a working PTSD Service Dog! Go Apache! After seeing the CST jackets in the trailer I had to check out the full documentary. After all by renting I was also making a donation to a good cause! Shelter Me was broken up into three parts. The first part followed two pit bulls from the time they were picked up off the street to finding loving homes. Two adorable dogs that goes to show you that there are plenty of wonderful pets waiting to be adopted from your local shelter. The second part of the documentary focused on two owner surrendered dogs that made their way from the animal shelter to the Canine Support Teams Prison Pup Program. This part focused more on the CST Prison Pup Program then it did on the two dogs, but it really gave you some insight into how much these shelter dogs impacted the lives of their trainers as well as the people they later served as working Service Dogs. Finally, part 3 focused on another Service Dog organization: Freedom Service Dogs. Part 3 was mainly about PTSD Service Dogs and really gave you an inside look on how these types of dogs change the lives of veterans with PTSD. Those short summaries do not do the DVD justice, but are just to give you a brief idea what Shelter Me is all about. This documentary is probably more interesting to me then it is for most other people. First of all, I feel connected to each of these stories. Part I has to do with dogs rescued from a Los Angeles shelter. I rescued my very first dog, Linus from an LA County Shelter. Part II has to do with shelter dogs working with Canine Support Teams in the Prison Pup Program. My last guide dog puppy graduated from the CST Prison Pup Program just over a month ago! Part III has to do with PTSD Service Dogs and the organization Freedom Service Dogs. First, a friend of mine actually volunteered at Freedom Service Dogs evaluating dogs to find if they were suitable as potential Service Dogs. 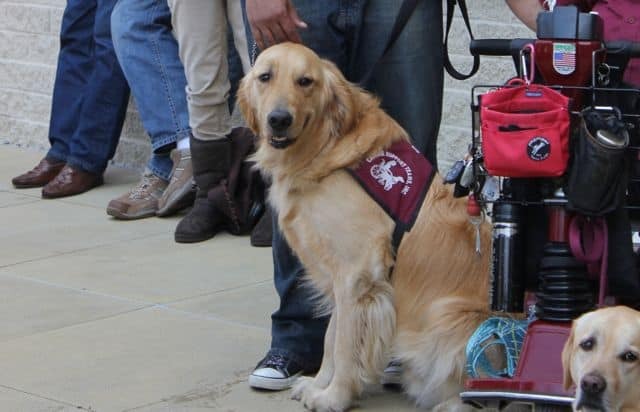 And of course, Apache graduated as a PTSD Service Dog! 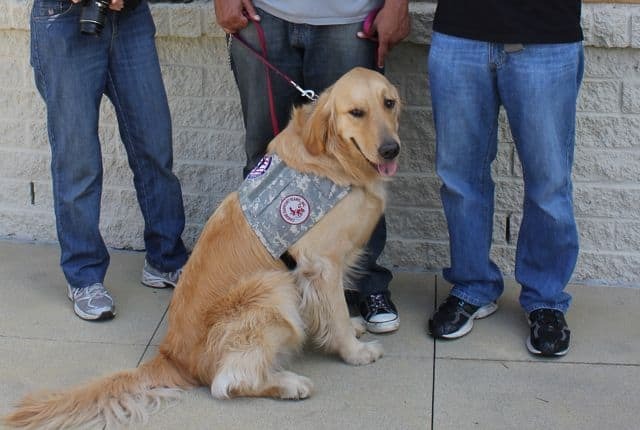 When Apache graduated, CST changed out his Puppy In Training jacket and replaced it with a Service Dog jacket custom made using material from Apache’s handler’s military uniform. So my review may be a bit biased, but I think this was a wonderful documentary that most animal lovers will enjoy. By the way, I was looking for Apache amongst the other Prison Pups, but I don’t think he was a part of that group. Apache was a bit of an over-sized Golden Retriever so I think he would have stood out amongst the other pups. What do yo guys think? Are you interested in watching a documentary about shelter dogs this weekend? If so, rent Shelter Me from your local Redbox and let us know what you thought about it in the comment section below. Awesome! Will share with my friends and I def know one of my plans for this weekend! I hope you enjoy the documentary. It was really exciting to see Canine Support Teams since we’ve been involved with them over the past few months. Sounds very good – even though past April 29. Dogs in the sanctuaries of which I am a part go into our Prison Program which is expanding to service dogs from CGC qualified dogs – our handlers made such great progress. Good for Apache and his move to CST. Congratulations! Thanks Roberta! It was very exciting to see Apache a little over a month ago and watch him work with his new partner. It’s so awesome to see what these organizations can do for both dogs and people. I hope you had a great time at BlogPaws! I followed the BlogPaws hashtag all weekend and it sounded like a blast.